Mountain search and discovery in Greece! Two great ancient finds! ancient sword & Byzantine mace! Located by combining 2 machines: GDI SPECTRA gold detector for long range and XP DEUS metal detector for pinpointing. GDI customer George Tsiardakas presents the detectors team that delivered the ancient finds. The SPECTRA long range locator & XP DEUS metal detector. Here I found myself again in the area where I made the great, double archaeological discovery, a year ago on October 16, 2017! Today, on October 19, and following the planned schedule to a search based on my metal detector usage license that is necessary in Greece and is issued by the ministry of culture. I visit the spot, which is near the village of Vitoli after Makrakomi. The purpose is to capture the events in a video that my friend, and detector seller John Kyritsis will post on his website. A little about the location. Right across of us is the river Spercheios, at the horizon Iti mountains and the villages of Fteri and Palaiovraha. The document by which I notify the local archeology about the use of a metal detector for the day of ancient finds discovery. The area from the historical background and information I had was hot with guerrilla activity during WWII. I have also to note that we were escorted by an employee from the local archaeology office, that may be assigned as a supervisor for the metal detector usage. At start, the SPECTRA gold detector was set up using the factory ground probe first. Before proceeding I did a test for any strong magnetic fields that may interfere the operation with an iron rod as a target sample. This test is performed without connecting SPECTRA’s power module amplifier and searching with the L rods alone. This you can view at the video of today’s presentation. As the day before was rainy, I used two long bronze probes, because with its shorter ground probe, the long range metal detector did not read the desired ground conductivity value on its screen. Then I was satisfied with the SPECTRA GBS ground value received, with a conductivity ID number of 75, I proceeded to research holding the gold-plated rods connected to their amplifier. I was commencing the scan for any possible signal. The goal I was looking for, was gold, and the program selected in the machine’s menu was Gold. The Frequency of gold chosen was 5252 Hz. After some time passed while walking around the ground probe, not any signal was received. I also moved SPECTRA once to about 70 meters away, (commencing a new scan). After realizing that I still did not got any signal I decided to stop and call it a day. Before I store the SPECTRA detector and leave, the archeologist asked me about the operation of the machine. It seemed strange to him, and I decided to perform a demonstration with another kind of metal. Just a short distance away there were 2 bars from a fence. I put the frequency of iron, to show him that the L rods will just guide me to over there. I changed the program option to MENU and selected IRON. Iron Frequency did not matter at all to me. It was the starting frequency of iron mode. The GBS, ie the ground identification number, was already there. I just let a little time pass and wait for SPECTRA to make rejection of all the other metal targets of this area and to show me ONLY iron, as I did with the GOLD option. On the first turn around the SPECTRA unit and before I even get to the straight line from the fence bars, I had a strong signal with a steep and fast crossing of the rods. I did not pay much attention. When I got into the straight line with the bars, it was exactly the same. There you could determine that the SPECTRA long range locator was correctly adjusted. Having in mind the previous signal, I decided to check it out of curiosity. I knew it was going to be an iron target again. So I turned back and when I caught the signal I started with a helical walk as an “S” to follow the target signal line. After about 30 meters I reached a point where I could not walk any more because the ground did not permit to do so. But I saw that at the point that I stopped, I was probably in the target limits, as the rods tend to turn slowly backwards. So I realized I may have passed the target. There clearly I needed to work the XP DEUS metal detector to center the target. So I started to search the spot. XP DEUS was set to MOTION 1 program that John Kyritsis XP metal detectors distributor in Greece had stored for me. I made a change and select iron volume at 5. At some point the target was actually detected. The sound XP DEUS detector was pulling out was the characteristic low tone that responded to iron and the display readings were in line with it. -This is a tractor component, like the nail from the plough. Okay, I told him, let’s get it out, even so it is a success for the machine, and I pulled the nose. – Certainly here would be a battle many years ago! The ancient sword and the mace were photographed at the nearby source where we quenched before they were handed over to archeology. I immediately thought, why not trying again around there with XP DEUS if I can spot something similar? Indeed, at about two meters from the ancient sword XP DEUS began to scream with low tone sound and the display to fill the left iron recognition bar. We decided to get out this target too. At first we saw an amorphous iron ball. We did not knew what it was. 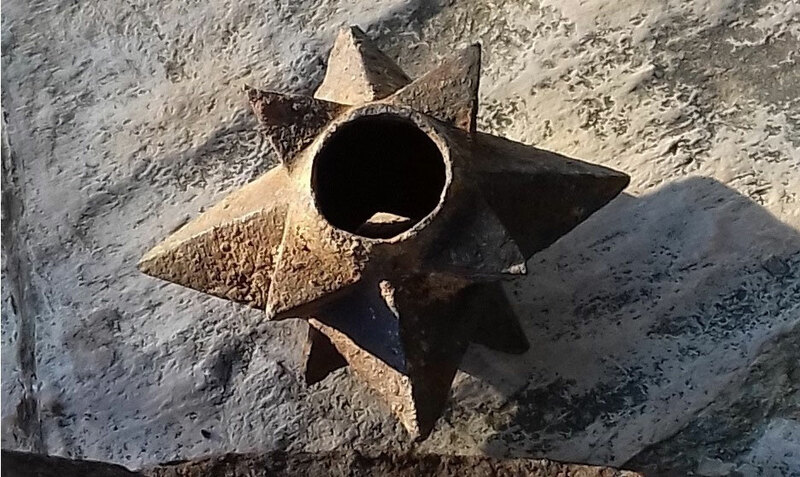 As soon as we removed the soil a hole appeared in the middle and we saw that this amorphous iron ball was an ancient weapon, a mace!. I do not want to say anything else. I was very successful on my outing. The archaeology office of my area was immediately notified for the findings. Those handed over to the archaeology employee who was with us. Until today the identification of what period the weapons belong to has not been finished. After a study I made on the internet I noticed that the mace is from the Byzantine period and was used primarily by an officer. Although it has been over 1000 years, it is in perfect condition as if it was forged today. Also the ancient sword despite its oxidation was solid and robust. To my opinion this discovery is a great success for GDI SPECTRA long range locator, and it had encourage me to step up and buy the updated RAYFINDER model which I now use at my treasure hunting trips in Greece. Tuned to the GDI gold detectors news!